The Chemical Guys Tire Kicker Extra Glossy Tire Shine will allow you to bring back that showroom tire shine we all love! Tires are the only thing actually touching the road when you drive, so it is easy to see why these can get extremely dirty and fade as the mileage on your odometer grows. Gray, faded tires are any eye sore that takes away from the look of your vehicle. Tire Kicker is a high quality formulation of a premium water based dressing, extra gloss enhancers, and UV blockers, all packed into a slick sprayable formula. Mist a light coat of Tire Kicker over the face of your tire, let dwell and simply wipe any excess product to avoid dripping, running, and any tire sling. The easy to use formula finishes dry to the touch and brings back the bright wet shine on the tires that we all love. Tire Kicker isn't just for rubber tires, try it on textured plastic, rubber, and vinyl parts as well. Kick up your detailing arsenal a notch and add the Chemical Guys Tire Kicker Extra Glossy Tire Shine today! Tire Kicker Extra Shiny Tire Shine Spray delivers long lasting wet shine and protection without any greasy mess. 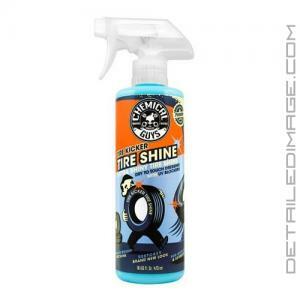 Tire Kicker is a sprayable water-based dressing that enhances a deep black shine on plastic, rubber, and vinyl car parts. The gentle formula is safe to use on car exteriors, interiors, and even engine bays. The sprayable liquid dressing restores a fresh new look to plastics and rubbers, and protects against the harmful UV rays that cause discoloration, fading, and cracking. The easy-to-use formula spreads evenly with any foam applicator or brush over textured bumper plastic, car tires, windshield cowls, large offroad tires, rubber window moldings, low profile street tires, engine bay components, fender liners, grilles, louvers, and more. The refined gloss enhancers and plastic nourishers penetrate deep into the piece, finish dry to the touch, and do not attract dirt or dust. Chemical Guys blended Tire Kicker for more shine, more gloss, and more durable protection. Work Tire Kicker into any vinyl, plastic, or rubber, then buff off any excess for durable protection and deep black shine on any trim pieces and tires. Shake well - Clean surface before application - Spray on applicator pad - Gently work into surface - Remove any excess using a microfiber towel - Reapply as needed - Safe for use on vinyl, rubber, and plastic surfaces. Just used the Tire Kicker Extra Glossy Tire Shine and I am pleased with the product thus far. Don't know how long it will last. It is glossy and did not splatter. I like the look. Time will tell. So far so good.